Skratch watched the Wabbit thrust the page into his fur - but was unprepared for what happened next. The ground was swaying, but not the same ground. These were the planks of a sail ship. Skratch watched the Wabbit carefully because he seemed nonplussed. He let his two extra cat heads float off for an extra look around. Wood groaned and canvas flapped but under all that noise, Jenny's voice was unmistakable. "I'll have no interlopers in my dreams." Skratch saw the Wabbit pull the codex page from his fur. "This is no ordinary dream, Jenny." 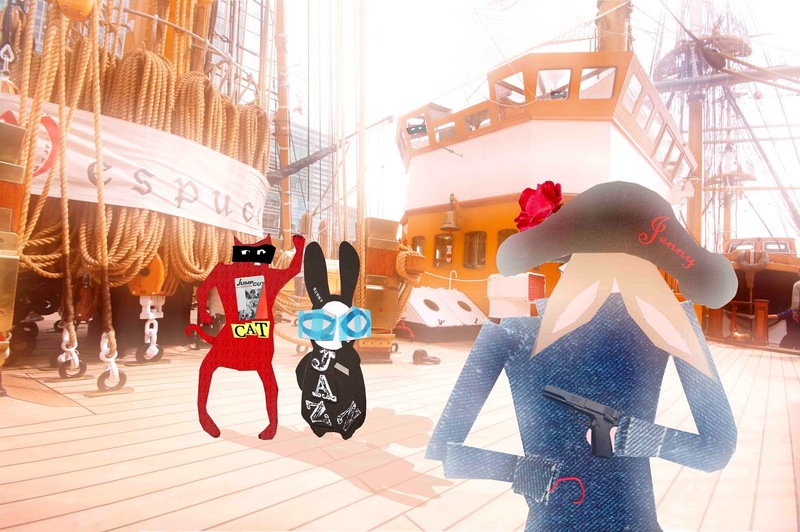 From behind Jenny's back, a snick of a safety catch echoed along the deck, "I can't be sure you're the Wabbit." Skratch smiled as the Wabbit shrugged. "OK. You are the Wabbit," snapped Jenny, "I didn't see you salute the ensign." "We're all in a dream," said the Wabbit. "Tell me about it," sighed Jenny. "Thieves took a secret code," hissed the Wabbit. "We have the missing page." A sudden impact rocked the craft and Jenny's voice barked commands. "Battle stations! Prepare to repel boarders." The Wabbit turned to look. "What ships' armaments do we have?" It was Jenny's turn to shrug. "Broadside cannons." Skratch knew the Wabbit had hoped for more but heard him speak clearly. "Let them think we're stupid." Another violent blow shook the hull. Jenny bellowed. "Give them a volley. Aim too high." Waves rocked the ship as cannonballs dropped aimlessly. 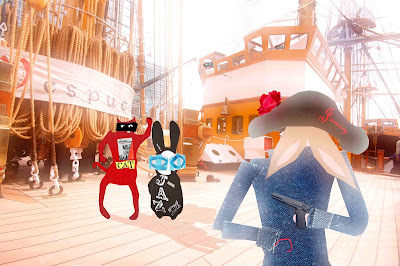 The Wabbit tore the code in three, then gave Jenny and Skratch a piece each. "Now what?" asked Jenny. "We wait," shrugged the Wabbit.